Welcome to our ABC's of Toddler Activities series! For the next five days I'll be sharing simple toddler activities with you as we move through the ABCs! Each activity will be easy to set up and use materials that you probably already have around your house. These activities aren't rocket science and some of them might not be brand-new to you, but they are tried and tested activities that my toddler has enjoyed... so perfect to bookmark (or pin) when you need a go-to activity on a boring afternoon. As you read these posts, think of your favorite toddler activities and see if you can add to this activities resource in the comments! Does your toddler have any other favorite activities that start with the letters A through E? I can only share one or two favorites in this post, and there are SO MANY so I would LOVE to have you add others. We've been wanting to make straw airplanes for awhile. This simple tutorial from Pea Pod Labs is very visual and shows you the basic instructions. We used tape, paper, straws, markers, scissors, and stickers to do our toddler version. Toddlers love stickers! Pulling stickers off and sticking them onto things is a great fine motor activity. My daughter is still figuring out how to pull them off by herself, so I will pull off a few and stick them on the edge of our table so then she can pick them up independently and stick them onto her project all by herself (baby steps, right?). 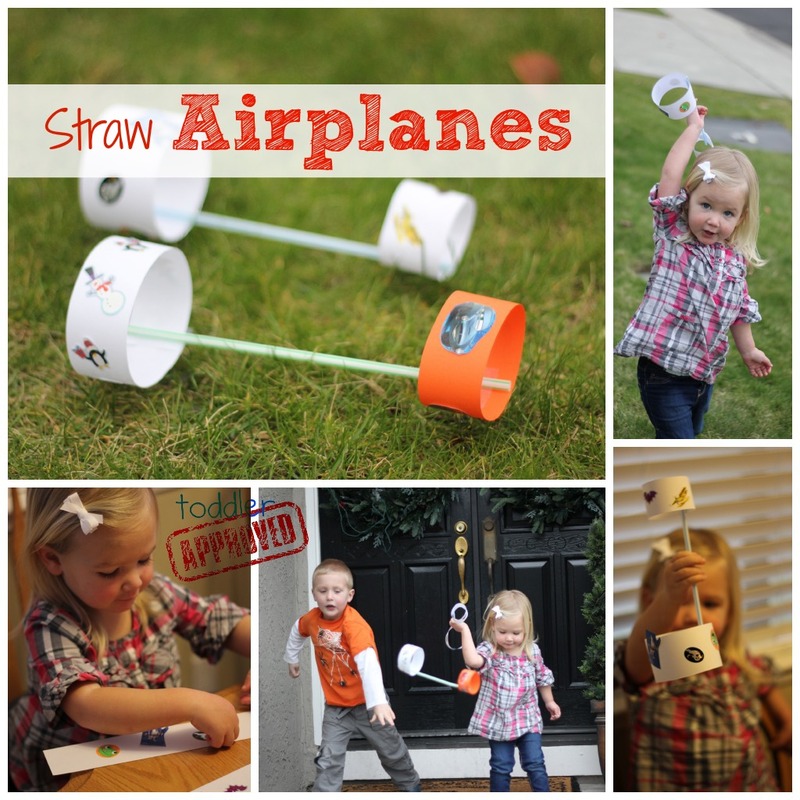 For this activity, my daughter stuck stickers all over her paper strips and then we taped one onto the front of her straw and one onto the back of her straw and headed outside to fly our straw planes! If your kids prefer coloring, they could also color their paper strips with crayons or markers. Big brother thought the activity was super cool and had to get in on the action too! We also LOVE alphabet games! Toddlers often start getting interested in alphabet letters as they begin to see them in books and other print in their environment (signs, TV, etc.). 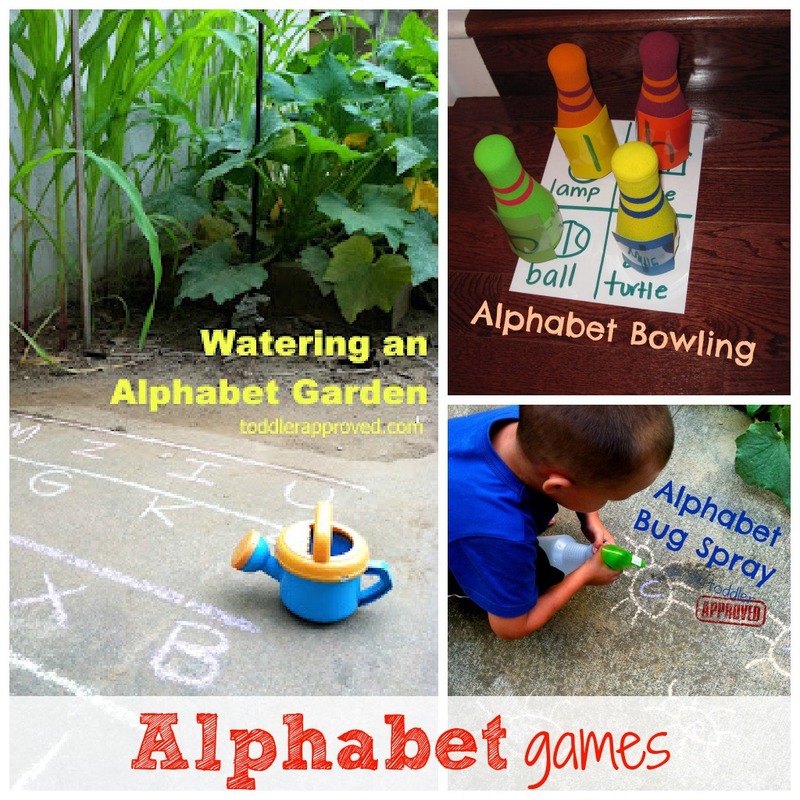 Playing games is a great way to have fun with the letters if your child is interested in them. 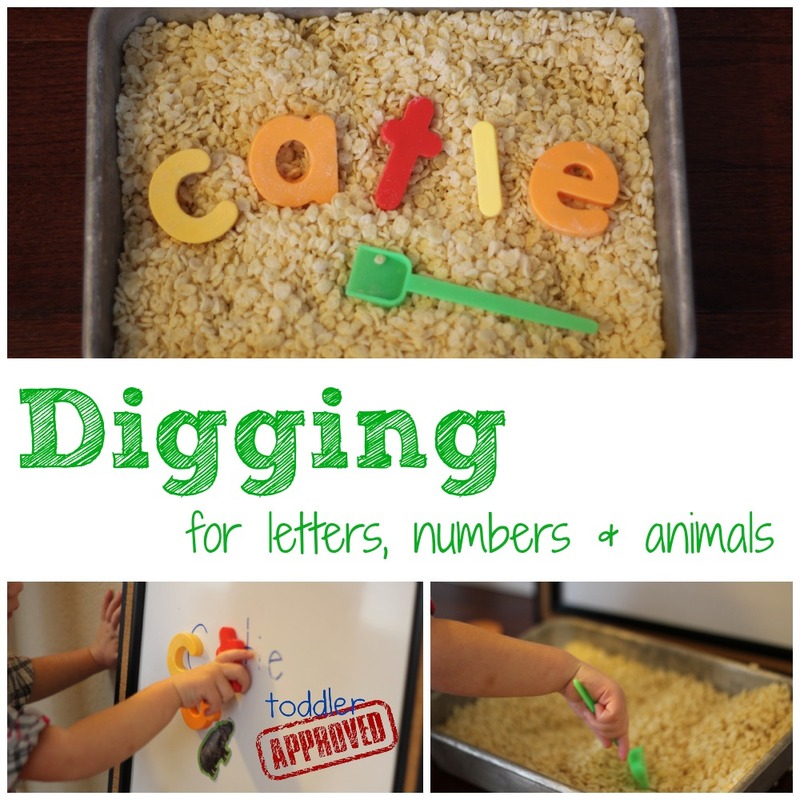 Any of these activities could also be adapted to introduce shapes and colors too if your child isn't interested in letters yet. Click on the links above to learn how to play these simple games. There are so many different ways that toddlers can build. My daughter loves building with blocks, stuffed animals, puzzle pieces, buckets, and pretty much anything we have lying around the house. Lately we have a lot of boxes hanging out because we ordered a lot of Christmas presents from Amazon. This week we worked together to tape up the boxes and then we started building! 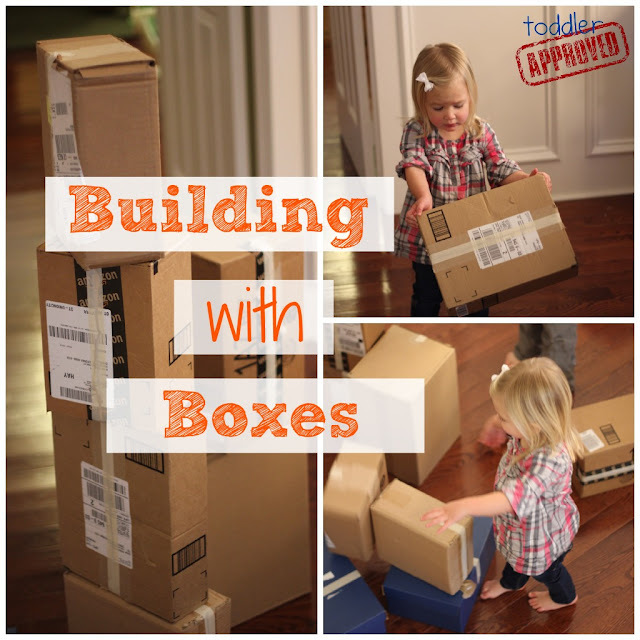 In addition to building towers, you can build cities, tunnels, or other structures for pretend play. The sky is the limit. The act of building is only one part of play... afterwards you can play inside and around the structures you create! In addition to building, my toddler LOVES knocking down boxes... so my son created a lot of towers and she rammed into them and knocked them over... and then they built them again. Both had a blast. 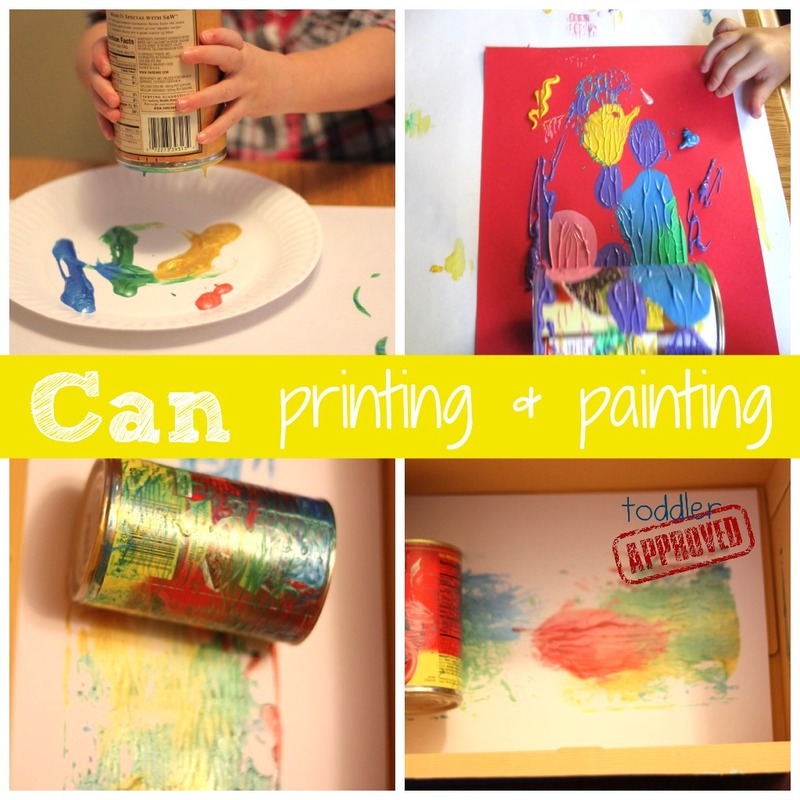 Can painting and printing is simple, beautiful, and such a great open-ended activity for toddlers! Just grab some paint, paper, and a can and start creating! My son likes getting really messy when we do this activity and my daughter is the exact opposite... so he used his hands and my daughter did can painting in a box so that her hands didn't have to get dirty! It is cool to put the box at an incline so that you can roll the can and see what it creates as it moves faster. These tin can partner paintings over at Teach Preschool would be awesome to try if you had larger boxes. Sensory bins can be great for toddlers. They can be made using all sorts of materials that you have around the house. For this simple sensory bin digging activity we grabbed some semi stale rice crispies that we found in the back of the cupboard, a mini shovel, and some magnets. You could also use rice, sand, dirt, beans, or any other materials you have around the house. We hid the magnets underneath the rice crispies and then my daughter dug and dug and tried to find them. We hunted for animal magnets, numbers, and the letters in her name. She doesn't know very many letters yet, so this was a low key way to talk with her about the different letters she found and introduce them to her. I wrote her name on our white board and when she found a magnet letter I asked her to try and match the letter to the written one the on the whiteboard. She also stuck the animal magnets on the board and we talked about their colors and characteristics. You could also create a simple sensory bin I-spy activity using other toys or materials around your house. Water sensory bins can be awesome too- especially in the summer. 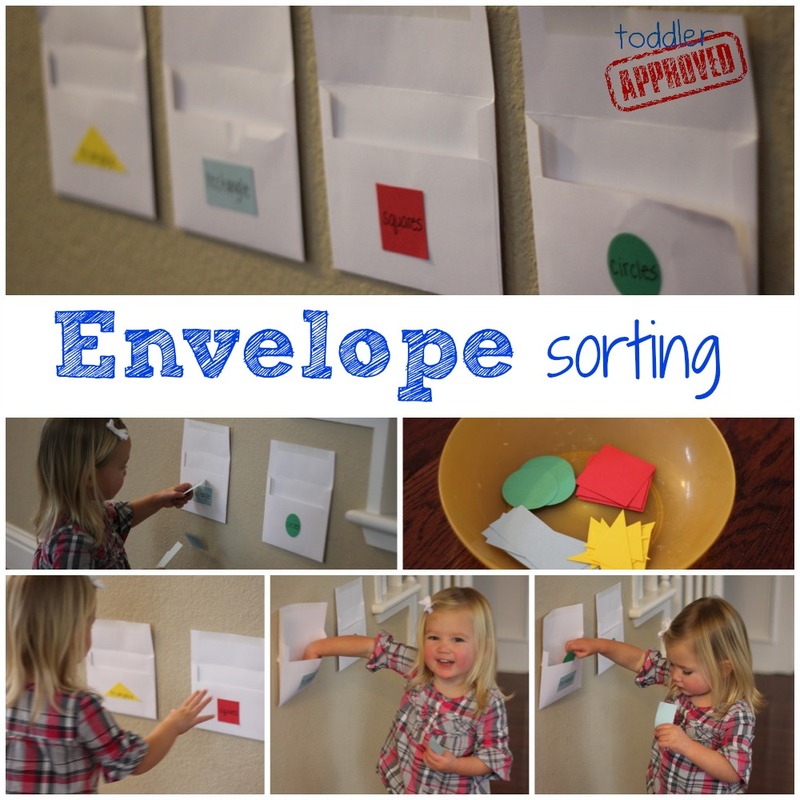 I thought about doing another simple elevator activity for letter E, but we had several leftover envelopes from sending out our holiday cards, so instead I set up an envelope sorting station in our hallway. I kind of thought the activity would be boring... so I am amazed that it has become my toddler's favorite activity. She keeps coming back to it again and again. I cut up a bunch of different colored shapes and then I taped one shape on each envelope. I stuck the envelopes on the wall and left a bowl of matching cut up shapes nearby. When my daughter saw the activity she showed immediate interest in it and started sticking the shapes into the envelopes. At first she just haphazardly stuck the shapes wherever she wanted. I let her do that for awhile while I just casually narrated what she was doing and talked about the shapes and colors ("Oh cool, you have a green circle!). Next I showed her the shapes on the front of each envelope and asked her if she could find the shapes that matched and put them inside. Excited about this new goal, she thoughtfully collected all of the green circles and put them in the green circle envelope and then did the same for the other shapes. As you can tell in the picture above, she had a great time and was pretty proud of herself. We'll definitely be doing this activity again with different shapes, letters, numbers, animal pictures, photos, etc. I'd love to hear your other favorite toddler activities A-E, so add them in the comments and if you have a blog post link or photo, come share on our Facebook wall! To see all the other ABC's series topics covered by my blogging friends, click on the image above. Tomorrow I'll be sharing several more toddler activities. They will start with the letters F, G, H, I, AND J... have any guesses what they'll be? Fabulous collection. Love the digging activities! Wonderful activities! Love the photos. Great list. Pictures are wonderful! Great ideas. My toddler sure loves digging! This was a good reminder that I need to do more of those activities. These look great! You have so many amazing ideas on your blog! That are some really fun activities. I can just visualize Aarya's happiness at the watering and spraying and everything in between. Thank you for sharing all these. Waiting for the rest. Please do stop by and say Hello to us!! Great ideas. Thank you. i will be sharing these activities soon on my blog. For the letter A we did Apple Painting. For B we did A lot of food activities bean counting. I have found that just looking around your house you can always find things that can go help teach the alphabet even going out side and going for a walk. Looking through a magazine searching for a certain letter is an activity we like to do then we cut them out and glue them on something. These are great ideas. I love your web page.